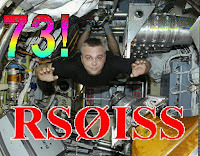 This image (above) of Maxim Suraev was sent in mode PD160 from the ISS using MMSSTV. PDØRKC captured the image about 0700 UTC on Dec 10 while the ISS was over Europe. 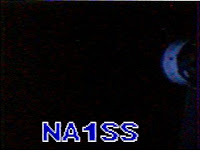 More captured images are posted at http://www.amsat.org/amsat/ariss/SSTV/. 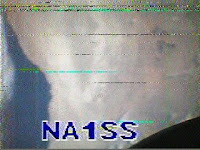 Another activation of the MAI-75 experiment using the SSTV system is scheduled from about 0700-1100 UTC on Dec 09-11. Various modes are expected with the downlink frequency being 145.80 MHz. Most activity will be in range of Moscow but some transmissions could occur beyond that region. Even less activity today. Seems the DATA connector on the Kenwood D700 is not getting a good connection to the VC-H1 system. That appears to be the cause of the unmodulated carrier and intermittent transmissions seen from the ISS. The experiment is scheduled to be turned off at 1410 GMT today. Seems that some initial images did come down for about the first hour after the system was first enabled but then the system was only keying down at the proper intervals (once every 3 minutes) and no audio was being relayed. Later in the day, the carrier switched to 145.825 and then about 1555 UTC, a partial image was transmitted. Reports after that seem to indicate the crew powered the system down as scheduled. Congrats to those that were fortunate enough to copy imagery and we will hope the operation will have better success tomorrow. Thanks to CR7/PY5RX for this image. The Russian team will be again activating the SSTV system on Aug 3 and 4 using the VC-H1 system. Images should be transmitted about once every 3 mintues for several hours each day (~0800-1600 UTC) on 145.800 MHz. 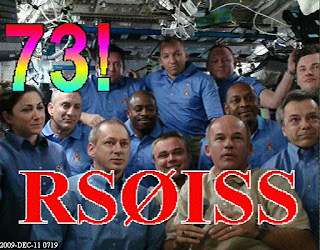 Good luck and don't forget to post your images on the gallery at http://www.amsat.org/amsat/ariss/SSTV/. 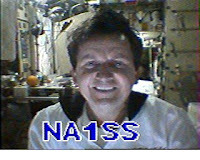 Space flight participant Charles Simonyi continues to transmit SSTV images and make random voice contacts. He will be leaving the International Space Station on April 8. Preparation for the return of the Expedition 18 crew of Mike Fincke and Yuri Lonchakov has already begun. The two will have spent nearly 6 months in space. Simonyi will return with them after his second trip of 13 days in orbit. Images being sent by Simonyi are being sent manually. 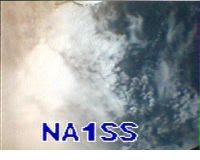 The images are taken earlier and then transmitted in rapid succession during passes mainly over N. America and Europe. 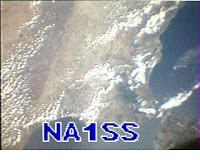 Charles sent numerous images in rapid succession over Europe during the ~1550 UTC pass. These are manually transmitted so the interval between images will vary and can be extremely short. One of the images from that pass of Charles was captured by PD0RKC. Charles is expected to continue sending images and making random QSOs in addition to the school contacts that are planned during his visit. It appears that the VC-H1 has been left on in the window in auto mode after the crew has gone to sleep. This means it should capture and send whatever it can see about once every 3 minutes until the batteries run down. The bad news is for folks where it is night time, only a black image with possible interior reflections will be seen. For the folks in daytime, the image might be of your part of the world as seen out one of the windows in the Russian service module. Once the batteries go low, a purple image with the callsign will get sent and then eventually that will stop. 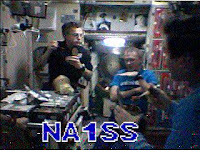 Some initial SSTV images were transmitted today (March 29) by Charles Simonyi using the VC-H1 unit on the ISS. Look for more images during his visit to the ISS.